February 13, 1935 was probably the first case of a major news organization incorrectly reporting a courtroom verdict because of a radio communications fail - the birth of Fake News! The Associated Press (AP) thought it was being uniquely creative - and sneaky - during "The Trial of the Century" involving the kidnapping and murder of Charles Lindberg's young son. 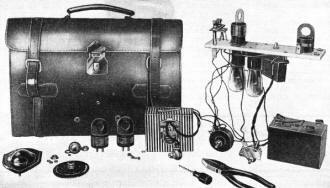 A reporter secreted in a miniature shortwave transmitter, concealed within a leather brief case. A receiver station above the courtroom stood ready to copy the agreed upon code, based on the verdict, and send the results to its newspaper feeds. Little did they know that a competing news agency had the same idea, but used a different code. The AP operator received the New York Daily News code assuming it was from the AP mole. It immediately sent the story to hundreds of editors across the world. One of the short-wave transmitters carried by a reporter into the courtroom at Flemington was concealed in a small leather brief-case - Take a look at this photo! 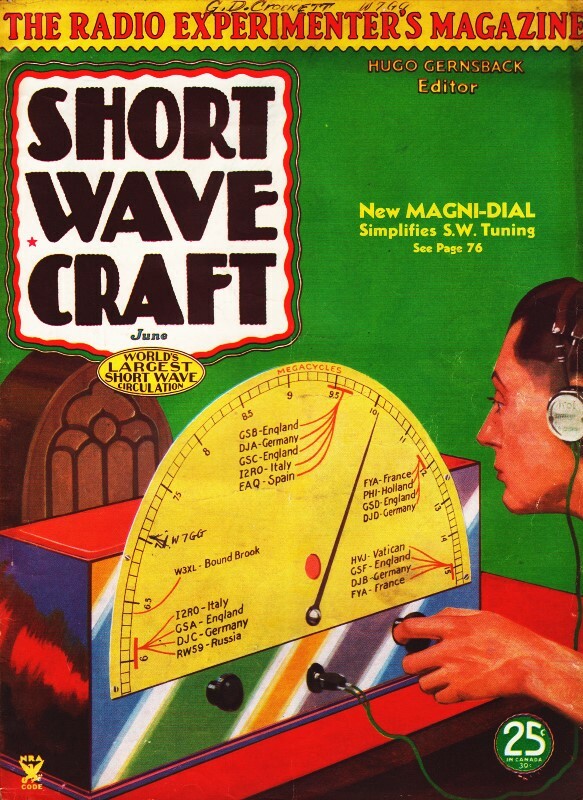 Short Wave Craft described how to build a short-wave set in a brief-case in the June 1932 issue - three years ago! With a slight change in the connections, this receiver is easily converted into a transmitter for code signals, such as those used at the Hauptmann trial. Short waves played a most important role in the famous million-dollar Hauptmann trial. Two tiny short-wave transmitters were secretly carried by reporters into the courtroom and were used to signal the jury's verdict to other reporters outside the locked courtroom. Short-waves will undoubtedly play many similar important roles in the future. Short waves played a very important role, in fact one of the most important of all, at the famous million-dollar Hauptmann trial, where they were called into action by the most important news-gathering organization in the country - the famous Associated Press. It is a long story, but briefly, here is what happened. If you listened to the radio reports which gave the jury's verdict on that eventful night when they walked into the courtroom, you will remember that the first verdict given over the broadcast stations was to the effect that Hauptmann had been found guilty, with a recommendation for mercy, which meant life imprisonment. A few minutes later a second broadcast came over the networks to the effect that he had been found guilty of murder in the first degree, which meant the electric chair. The reason? Oh, just a little mixup on some short-wave code signals, and it happened in this manner. The Associated Press reporter who carried a tiny transmitter with battery and all concealed in an ordinary leather brief-case, sat at the press table and if the jury's verdict was "Guilty - Recommendation Mercy - Life Imprisonment" the A.P. code signal for this verdict was four dots. An A.P. telegrapher sat at his key in the cupola above the courtroom and suddenly was startled by hearing a signal of four dots in his headphones. But the four signals which he heard, sad to relate, did not emanate from his buddy's transmitter in the little portfolio lying so innocently on the table in the court-room. 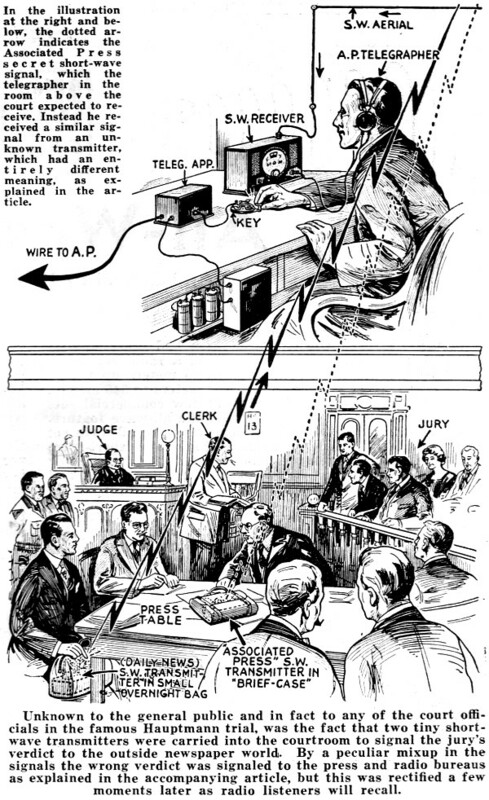 In the illustration at the top and below it, the dotted arrow indicates the Associated Press secret short-wave signal, which the telegrapher in the room above the court expected to receive. Instead he received a similar signal from an unknown transmitter, which had an entirely different meaning, as explained in the article. 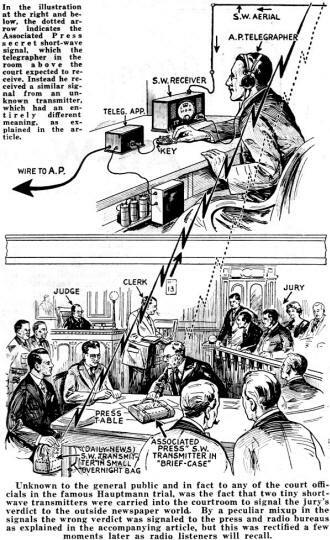 Unknown to the general public and in fact to any of the court officials in the famous Hauptmann trial, was the fact that two tiny short-wave transmitters were carried into the courtroom to signal the jury's verdict to the outside newspaper world. By a peculiar mixup in the signals the wrong verdict was signaled to the press and radio bureaus as explained in the accompanying article, but this was rectified a few moments later as radio listeners will recall. Unknown to either of the two A.P. news-gatherers was the fact that the New York Daily News also had a reporter in the courtroom with a second short-wave transmitter, this one being hidden in a small overnight bag. Just to make things interesting the Daily News man's code signal to his coworker on the outside of the locked courtroom was four dots to indicate that the jury had entered the courtroom! So behold, here is what happened! The Daily News reporter sent the four dot signal, the A.P. telegrapher in the cupola above the court-room heard them and presto - out to a waiting world flashed the news via his trustworthy telegraph key that life imprisonment was Hauptmann's fate! As explained in an article appearing in Time magazine, the Associated Press explained how a garbled radio message had been responsible for the wrong news flash, which undoubtedly got into many newspaper headlines all over the country, aside from the Press Radio Bureau, but few people believed it; some editors charged that the A.P. reporter had guessed at the verdict and made a bad job of it or else that he had been tricked by the word of a bribed court attaché. The editor of this magazine endeavored to find out more details concerning the matter of the short-wave transmitters carried by the Daily News and also the Associated Press reporters at the Hauptmann trial, but aside from the fact that they did not deny that such ultramodern means of conveying intelligence were used, practically no information could be obtained. The Daily News admitted however, that undoubtedly miniature short-wave transmitters of this type would play many important roles in gathering news at future court trials and other important hearings. All of the foregoing is distinctly not news by any means to our forty odd thousand licensed Hams, and the editors do not need to point out that it is strange indeed that such use of small S.W. portable transmitters has not been made before - and, as a matter of fact, they undoubtedly have been used by many but no one happened to find out about it. One of the accompanying pictures shows a brief-case short-wave receiving set which was designed and built by Clifford E. Denton and the editors three years ago! It was fully described and illustrated with diagrams in the June 1932 number of Short Wave Craft. By making a slight change in the connections, this receiving set can be instantly converted into a transmitter for code signals and undoubtedly that is just about what the small battery-operated transmitters used at the Hauptmann trial consisted of. For the short distance over which the signals had to be transmitted, possibly no more than 100 feet, no aerial would be needed for the transmitter and this would also be true for the receiver. The range of such a transmitter would probably be a half mile or more with only a small aerial; so far as the reception range is concerned, signals were picked up over a distance of 2,500 miles with this brief-case receiving set and a pair of fairly sensitive headphones.